Uglyworld #1940 - Star Trekkerings - (Project Cinko Time - Image 146-365), a photo by www.bazpics.com on Flickr. Todays we drivereds down from Scotlands to our finals overnighter accomodationers in Kents, and decidereds that the perfects way to rounders off our holimadays would be to heads to the cinema! 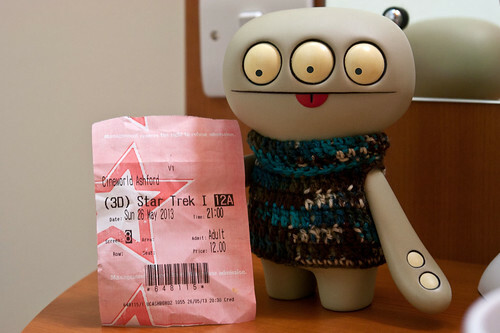 Mireille wantereds to watch some soppy romanticals nonsensers, and Baz wantereds to watch some car nutterers fimer, so I gots to makes the decisioners for whats filmer we would all goes and watchers, so I choosereds Star Trekkerings. Oh boys was it funs, especiallies as it was in 3D's, holy bumfizzlers that was exciterings when stuff flyers right pasts your head! And more importantlies, as I has 3 eyes, I reallies could watchers it in 3D's!